Welcome to the perfect spot to discover Beaufort's magical Historic District! We receive great reviews from our guests, and can't wait to welcome you! Explore Beaufort’s Civil War and Reconstruction history. Rent this charming, professional decorated townhouse- it’s perfect for up to 4 people. Our guest’s comfort is evident in every room. You will have space to relax, including a comfortable living room, dining room, fully-appointed cozy kitchen and additional outdoor dining and seating areas. Original local artwork throughout. There are 2 bedrooms, both with custom linens and lots of storage. The queen bedroom overlooks the back courtyard. The second bedroom, with two twin beds, has great morning light and overlooks the main street. Guests say they especially appreciate the private, sunny courtyard, library of local authors and movies, and the off-street parking. Everything you need is at hand: cozy kitchen with stainless appliances, Washer/Dryer, land line phone, high speed WiFi, HDTV, Cable, DVD+CD players, coffee maker, microwave, toaster, hair dryer, iron. bed linens and towels. Library of local themed books and dvds. You’ll receive a link to our “Inside Tips” for unique sites, the best local restaurants and favorite shops. Imagine no car required for a pleasant walk or bike ride to the museum, shops, art galleries, restaurants and beautiful Waterfront Park. Return to enjoy your own private getaway! You will feel just like a local in this charming retreat! Two free bikes take you anywhere - and you’ll be on the free downtown shuttle route. Enjoy yourselves! For your comfort we employ professional housekeeping only-and our property is licensed and inspected by the City and State. Come to Beaufort! Book now! Gary and I fell in love with the area on our first visit together in 1998! And because we are VRBO guests in other cities, we have applied everything possible we have learned from our travels for our guest convenience in our Beaufort home! Location! Location! Location! Incredible historic neighborhood! Walk right out the door to an Antebellum setting of cottages and mansions, the waterfront, a movie and performance hall, shops or restaurants. Lovingly decorated in Carolina Lowcountry style to reflect the local flavor. As our guest, you'll receive a custom-designed electronic guidebook with unique insights on spots to visit. Everything is prepared for you to live like a local! Newly renovated full bath on private upper level, Powder Room/Half bath downstairs. Towels provided. Both inside and outside dining areas! Licensed by state and city. Professional housekeeping service. This was the perfect home to visit Beaufort. The location had us extremely close to the downtown, and was still secluded enough to avoid the traffic. There were so many personal details to make our stay comfortable- from the local film library, to the great outdoor space and bikes. It was the ideal VRBO. We will look forward to visiting again, and plan to recommend this retreat to all of our friends visiting the area! Loved our Island Townhouse stay! Sara's Island Townhouse was a quaint and quiet oasis for our weekend mini-reunion. We spent most of our time exploring Beaufort and trying out the many great restaurants so we didn't do any cooking, but we did use the Keurig coffee maker and K-cups provided. The beds were very comfortable and the linens and towels were high quality and plentiful. Morning coffee out back on the patio was lovely and the reserved parking spot directly behind the property was great. The location was terrific; we walked everywhere...including the bayfront park area for "Shrimp Fest" which was so much fun! We only spent three nights in the townhouse, but had we stayed longer, we would have taken advantage of cooking and dining in, the washer and dryer, the two bicycles, and the movies, books, and games provided. Thanks Sara for making the booking process so simple, instructions for the TV, wifi, and all appliances clear & conveniently located, and keeping your home so clean, comfortable, and welcoming! Susan, You were such a joy to work with-from the moment communication began I knew you would be a great fit for the townhouse! Please come back and stay longer! Our family enjoyed this property very much. It is a very nice, clean, comfortable home. I would highly recommend this place to anyone coming to the Beaufort area. It’s like walking into a home away from home- it has everything you’ll need, very clean and comfortable. 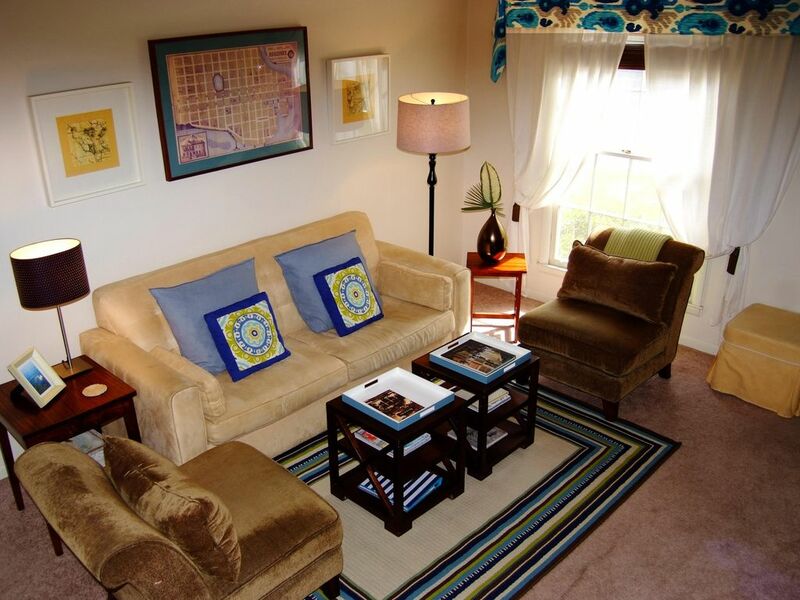 The location is perfect, walking distance to beautiful downtown. Sara is very helpful and accommodating. You won’t be disappointed! You were terrific to work with and I am so happy you enjoyed your visit! Please come back soon! Thoroughly enjoyed my stay in the Island Townhome. It’s in a great location and was perfectly appointed for me and my family. Would definitely stay again. So glad you enjoyed the townhouse and your visit! We would be delighted to have you return anytime! Great accommodations in the heart of Beaufort. Clean, comfortable, and convenient. We were a group of 4 (2 couples) and this home was very accommodating for us. Very clean, well appointed, fantastic artwork, comfortable and everything we needed for a wonderful stay. Well located to explore Beaufort and Sea Islands. We highly recommend this home for a stay of 4 or less people. We are so grateful to have wonderful guests like you all! Thank you so much for the great communication and for finding us! We are delighted you enjoyed your visit! A friend and I bopped on over to Beaufort for a long weekend of exploring. Found this gem of a place and it was perfect! Sara is an amazing host: lots of communication, including an online guide to adventures, restaurants, shopping and other activities to check out. The townhome is on the edge of the Old Point neighborhood of historic homes, and less than a 10 min walk to Bay St. It is stocked with tons of little touches and amenities that make you feel at home. It's a great value. Michelle you were an awesome guests and we can’t wait for the opportunity to have you return! Golf: We have several golf courses. All Guests will receive a Reservation Agreement to sign and return prior to locking the dates and receiving their keys. The document contains policies and instructions along with helpful travel tips. Rates are subject to change.